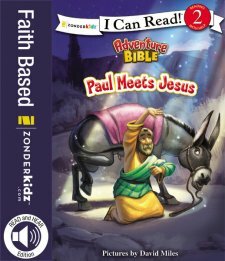 Book Review: "Paul Meets Jesus"
This level 2 easy reader book, "Paul Meets Jesus" is an easy to read story discussing when Paul meets Jesus. The transformation that that occurred with Saul to Paul is one of my favorite Biblical stories. I love seeing how a man who hurt Christians finally has a God encounter and his heart is transformed. I love to pray dangerous prayers with my children and this story led us to pray for more people to have a God encounter and have hearts transformed just like Paul's 180 turn around. I love the easy reader series. My daughter is 8 and is a great reader and as she read this book she used many different voices so it was adorable. The pictures are eye catching and bright. Overall this is a great story to add to your library. Thanks BookLook program for sending me this book free of charge in exchange for an honest review. I was not paid for this and all opinions expressed are 100% mine.